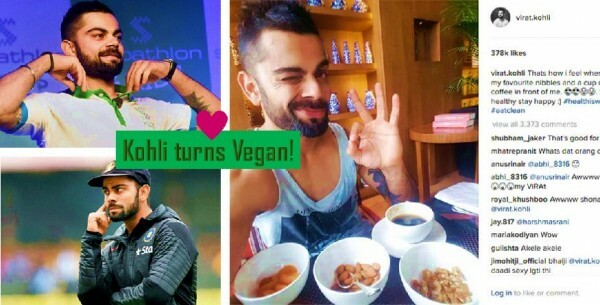 Virat Kohli is Vegan ! Many celebrities are vegetarians and vegans. Being ambassador of animal rights and their passion for animals both have turned many non-vegetarian actors, athletes and prominent personalities to either vegans or vegetarians. Recently Indian Cricket team Captain Virat Kohli decided to get help from plant protein while moving away from animal protein. He strongly feels, personally this decision helped him a lot. It helped him to perform better at his favorite sport. According to reports, Kohli’s current diet contains plant protein shakes, vegetables and soya, He has given up on dairy products as well as eggs. Four months back Kohli decided to stay away from animal protein. The one result that he notices was his digestive power has increased with the diet and feels stronger. Ever since he does not miss meat, dairy or eggs. Vegan diet is also helping him personally to be calm and positive effect on his temperament. Which means vegan diet has positive influence on the cricketer and it is remarkable. While Kohli turned to be vegan, his wife actress Anushka Sharma had also turned vegetarian. The change of diet was planned well in advance. As per sources, two years ago Kohli when was on a normal diet stated that if given a choice he would go vegan. Today he feels stronger than before about (it). Kohli revealed his workout and diet plan last winter in a show “Breakfast with Champions. Kohli conceded on the show that he has not eaten naan and butter chicken for four years! He revealed his ultimate cheat meal would be chole bhature at Rajouri garden. His favorite nibbles are dried fruits and nuts along with a cup of steaming black coffee. Many sport stars like Serena Williams, Venus Williams, four-time Formula One champion Lewis Hamilton, legendary sprinter Carl Lewis are turned vegetarians in recent times. Being an undoubtedly fittest athlete and an youth icon in the world Kohli is going to be a role model and people look up to him. His passion for animals and love for athlete only proves how good an athlete he is. His fitness goals not only for his fellow athletes, also for youths and masses around the world. Indian cricketer is now proud of his diet and says it has become his second nature. He recently became the first Indian captain to complete 1000 runs in Test cricket three years in a row when he struck 24th hundred again West Indies.